On the 24th of March 2015 the German co-pilot Andreas Lubitz caused the destruction of the 4U9525 Germanwings flight from Barcelona to Dusseldorf resulting in the deaths of everyone on board (himself, 144 passengers and 5 other crew) making it one of the most deadly murder-suicides in history. At first the cause of the crash was a mystery but it soon became clear that Lubitz had deliberately locked the pilot out of the cabin, used the cabin door override to prevent the captain from using his passcode to open the door from the outside, initiated the descent sequence that resulted in the crash and remained alive (and calmly breathing) until the moment of impact. A few days later it was revealed that Lubitz's flight training had been interrupted for several months due to mental health issues. It's not entirely clear what these issues were, but several German sources cited depression as being the cause of the interruption. These revelations provoked lurid headlines across the British press. 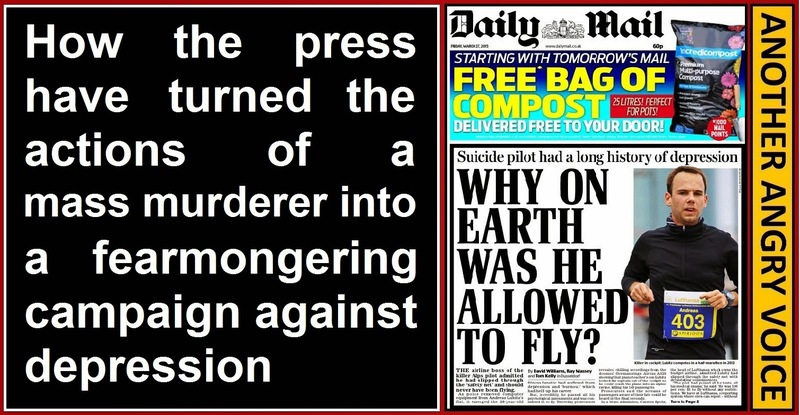 The front page of the right-wing Daily Mail screeched "Why on earth was he allowed to fly" and the pro-Labour tabloid The Daily Mirror also boldly linked the actions of the killer with his depression on their front page. The tabloid press weren't the only ones either, the Times and the Telegraph both also ran the killer was depressive theme on their front pages too. got in on the act too. The mental health charity Mind quickly stepped in to complain about the way that such lurid headlines add to the stigma associated with common mental health problems like depression and several bloggers and columnists have spoken up to draw attention to the fact that they have suffered depression and the idea of committing a mass murder-suicide has never crossed their minds. The fact is that there are millions of people out there who have suffered depression. Amongst them are countless people with high responsibility jobs. 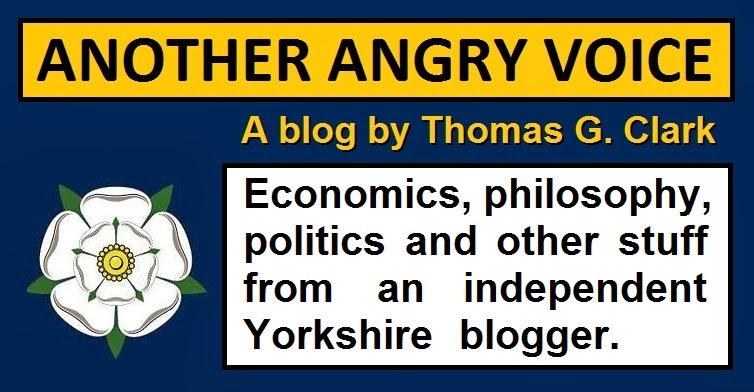 Pilots, train drivers, bus drivers, fuel tanker drivers, nuclear power plant workers, air traffic controllers, engineers, operators of dangerous machinery, firemen, policemen, military personnel and health professionals. If the lurid Daily Mail headlines about the fact that Andreas Lubitz had depression are enough to make you think these people should all be stripped of their jobs because they represent a danger to the public, then I'd suggest that your mental problems (paranoia, delusional thinking, a bizarre lack of perspective, lack of empathy) are far more serious than those of most of the people you want to have fired from their jobs. I am one of the tens of millions of people with a history of suffering severe depression. In fact depression is the reason that this is the first article I've posted on my blog in over a month. I'm currently struggling with personal circumstances that are beyond my control, leaving me with no choice but to figure out which of the highly unfavourable options in front of me is the least bad. As a consequence of facing such an appalling decision I've slipped into a prolonged depression. Even though I get an immense amount of satisfaction from writing articles, designing infographics and debating politics with people, the idea of doing any of that stuff when I'm in the pit of depression, struggling with issues that are beyond my control, is frankly ludicrous. The only thing that has snapped me out of this depression for a while is the way that the UK press have resorted to demonising depression, as if people like me are all potential mass murderers to be frightened of. Simply having suffered depression isn't enough to turn a person into a mass murderer. In order to commit an act of mass murder the individual needs to be suffering much more serious issues than depression, because being depressed doesn't necessarily mean that the individual suddenly loses their ability to feel basic human empathy for others. In fact I'd argue that many people who have suffered from severe depression are actually inclined to be very empathetic indeed, since familiarity with their own suffering gives them great scope for understanding the suffering of others. Adreas Lubitz may well have suffered from depression, but the premeditated decision to murder 144 passengers and 5 work colleagues, for whatever reason, are clearly the actions of a psychopath without the capacity to feel basic human empathy. If Lubitz had had any capacity for empathy whatever, he would have considered the enormous wave of suffering such an action would unleash on the families and friends of his 149 victims and realised that such a vast tsunami of grief would massively outweigh his own depressive issues. Such a realisation would have driven him to either quietly commit suicide on his own, or to actually accept the medical help he had been offered and rejected. Only a psychopath would be able to consider going ahead with a plan that involved murdering so many other people and causing such a huge amount of human suffering as a consequence. Andreas Lubitz's ex-girlfriend claimed that he killed all of those people in order to "make people remember him". Without a suicide note it's impossible to know for sure that this was his intention, but if it was, then this suggests that he wasn't actually that severely depressed at all. People with severe depression tend to try and reduce their suffering through medication, withdrawal, distraction, therapy, alcohol, drug use, or even suicide. They're usually far to busy with their (often highly ineffective) coping mechanisms to spend their time fantasising about how they might make themselves infamous and calmly planning acts of mass murder. 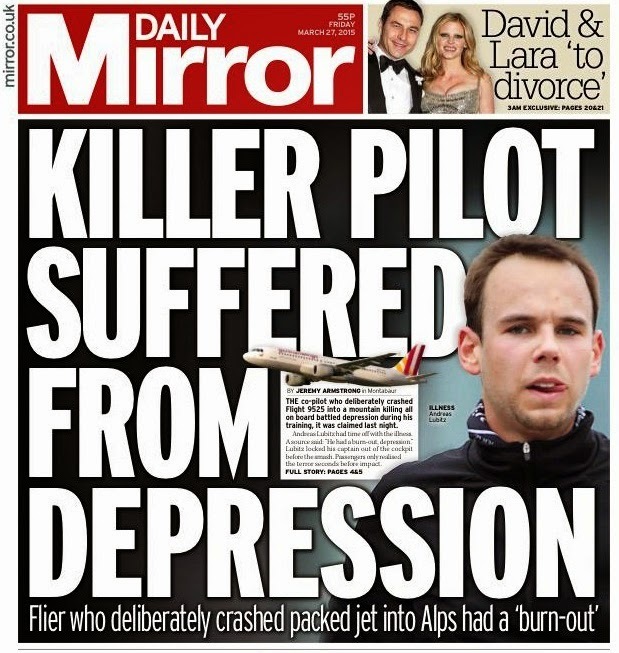 The efforts by the UK press to draw a causal relationship between Andreas Lubitz's depressive tendencies and his premeditated decision to murder 149 other people is grotesquely irresponsible, and such ignorant fearmongering about depression only make it more likely that many other people with depression will try to hide their suffering out of fear that people will demonise them as potential killers or hound them out of their jobs. As a sufferer of depression with a reasonably large public profile I feel compelled to stand up on behalf of millions of others and say that it doesn't matter how severe our depression gets, we won't be murdering anyone, ever - because we're not psychopaths.